A culmination of collaborative work between myself, weaving the items for the poster and the creative minds of photographers, editors and designers, I am able to present to you all, posters of the weaving of Guam. I decided to make these posters because of a lack of documentation and availability of Chamorro language materials, in particular in the area of weaving. There are posters which are made by the Depart of Education, Chamorro Studies Division, but they aren’t necessarily available to the public (from what I can tell). So here I present to you my passion, i tinifok ManChamoru (the weaving of the Chamorros)! 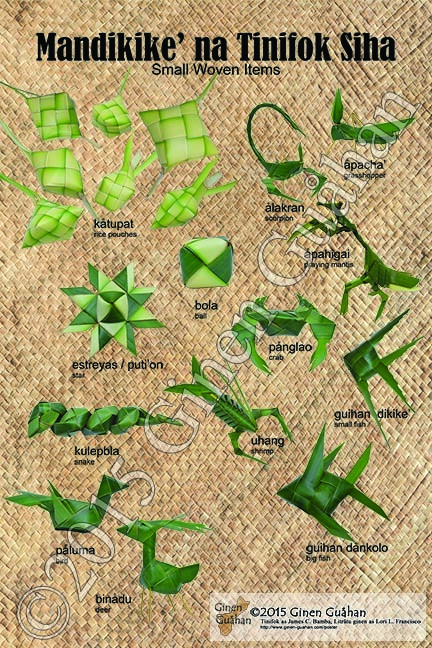 Mandikike’ na Tinifok Siha – Small Woven Items, which contains 19 different woven items, with Chamorro and English names! A great teaching aid for teachers and parents alike! This poster is available in two sizes at this time, 13in. x 19in. and 24in. x 36in. Please click the link above to visit my Etsy page to purchase! Si Yu’os Må’åse’ for your continued support!